Rob Legg has designed a new boat, which is great news for all Australian sailors! This boat is designed to satisfy category “5”, “6”, and “7” under the YA racing rules of sailing. Category “4” would be possible with the required modifications and additions, refer to YA rule book. Accommodation is minimal, and just satisfies the rules referred to for trailable boats ( category 5). Care should be taken that the hull does not exceed 6 metres otherwise cabin headroom would have to be increased by 0.2 metres. Note that the boat should be very competitive if built as light as practicable and could be expected to attain planing speeds in winds of 12 to 15 knots downwind, provided weight is kept to a minimum. Could be raced with a crew of two (slab reefing recommended) or three, with four persons as a maximum at any time. 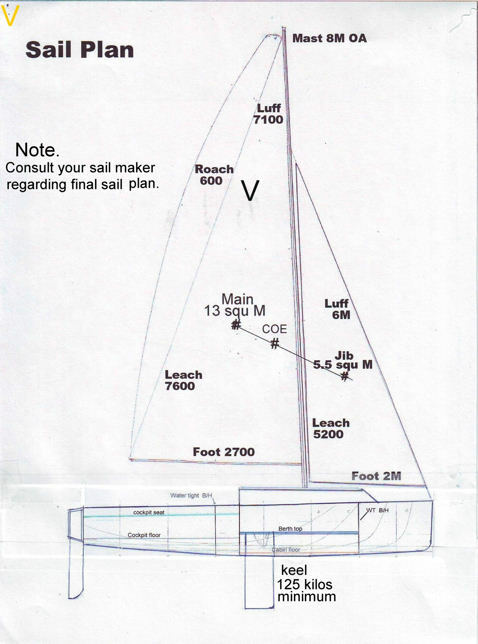 For a final sail plan consult your sail maker. Exceeding the designed sail areas is NOT recommended. 20 feet overall length with a retractable bow sprit. Self draining and self righting. High performance and exciting to sail. Keel: lifting with lead only in the bottom half. Rob would not be involved in the construction of the new boat. Do you know any boat builders who might be interested in getting involved in this project?